I’ve spent this afternoon finishing off a watercolour picture that I began several months ago and then left in my ‘to be continued’ pile. After writing The Pixie Party last week I was inspired to finally complete it. 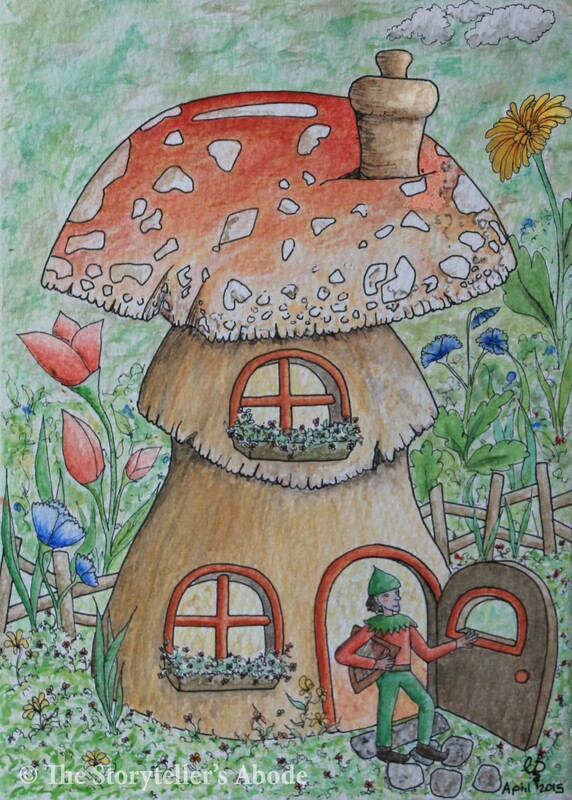 This is Tixel, who appears in the story, and his toadstool house. There is a colouring picture version of the house available here. That’s really lovely- you’re quite the artist! Did you draw your blog header as well? Very nice, and it has a lot of detail. This is a very touching illustration. There is a warm roundness to it that is so inviting and I love your color choices as well as how they fade in just the right places. You are so talented! Fun to follow your inspiration and see you jump in when you feel it is right. I LOVE it! You are really talented. I love the toadstool house!